This has been a long time coming. It's been a year since it was announced. I've had it on pre-order from Amazon since early January. Being an OVA it will be at least a year before the story will end. Anyhow on with the review. I received the disk on Friday, release day (gotta love Amazon), and have already watched it three times. Once with subs, once dubbed, and once again with subs. I'm fairly agnostic in the subs v dubs debate, but I will admit that when a dub is bad it's usually really bad. One can usually trust Bandai to do a good job on dubbing, especially on their more serious series like Gundam and Code Geass. No exception here, the Dubbing was excellent. Sync was great and the script matched closely to the subs. This was the first anime I've seen on Blu-ray and I have to say I was impressed. The Animation was smooth and crisp. There was a noticeable difference in cell count vs TV anime, even Gundam. The Sound was also good. Being a Blu-ray there was full 5.1 Digital Dolby as well as normal Stereo. Effects were great, and immersive; some sound editor some where deserves a cookie. The story is unique as it is the first time since 08th MS Squad that they story has returned to the Universal Century. It also seems to be striving to act as a bookend to what was done in MS 08th Squad, whether it was intentional or not. 08th MS Squad was suppose to be about the "Real" One Year War, it was to explore how the average MS Squad fought and lived on the battle field in the Jungles of SE Asia. Unicorn seems to have a much higher aspirations. They intend to explain it all. Why humanity has gone down this path in the Universal Century, and how to finally put the fighting to an end. The show opens to the speech by the President of the Earth Federation giving the dedication speech in one of the first space colonies ringing in the year UC 0001. In the middle of the speech there is an explosion that destroys the colony. This event is knows as the Laplace Incident. A lone astronaut who was outside the colony is blown clear, and seems to come into possession of some kind of object. This object will become the MacGuffin the "Laplace Box." What's unique here is that for the first time, that I know of, the Universal Century is established to directly succeed Anno Domini, previously this has remained somewhat of a mystery. Fast Foward to UC 0096. It's been three years since the events of the Neo Zeon war of Char's Counter Attack, and 16 years since the One Year War. Neon Zeon is still around but in hiding from Londo Bell and the Earth Federation. Tensions are still high, but calm, and normalcy have taken over the lives of your average spacenoid. New Types are only seen as myths and legends. Products of battle field hype more than anything. Our hero this time around is Banagher Links, 16 year old first year student at Anaheim Electronics Technical College. Anaheim Electronics is the manufacturing company based on the moon who build the very first Mobile Suits. Always Neutral throughout all of the various wars they provided arms to who ever would buy them; who they are and their motivations over the years will be a major plot point in the overall Unicorn story. Back to Banagher. He's an Orphan, is mother died a few years prior, and he doesn't know who is father is. He's appropriately angsty for a Gundam Protagonist, but he's on the calner side of the continuum. Close to Athrun Zala than he is someone wound tight like a Kamille Bidan He's more passionate about stopping war than he is with proving himself to anybody. So far, this may be the first Gundam series to not debate the theory of Just War in one fashion or another. He also is already showing Newtype tendancies. He can sense danger, and the presese of other Newtypes. Our Heroine, at least initially is "Audry Burn" aka Mineva Zabi. She is the head sovern of the Zabi family, and thus also the leader of Neo-Zeon. Her goal is to prevent the coming war by preventing Zeon from obtaining Laplace Box. She is the first returning character from previous Gundam Series. She played a minor role in Zeta Gundam. Cardeas Vist is the primary antagonist of the first episode hes the head of the Vist Foundation and by default also Anaheim electronics. His Grandfather Syam Vist was the young man who came into possession of the Laplace Box during the Laplace incident in UC0001. The Laplace box has given the Vist Family and Anaheim great power and success, but we're told that this success has come with a price. What that is is unclear at this point. Cardeas believes it's time to give the box up, and is in the process of making a deal with Zeon for it. Zeon is surprised that his intention is to give them the "Key" to The Laplace box and not the box itself. Right as their about to make a deal everything goes wrong. Londo Bell discovers Zeon and attacks. They fight is brought into the colony itself, much of it is destroyed. During this battle Banagher finds his way into the Mobile Suit Hanger. He approaches the Unicorn Mobile Suit, where he sees Cardeas in the cockpit working. He confronts him, wanting answers as to why he's so hell bent on giving Zeon the Laplace Box and starting war. Cardeas talks about what a double edged sward the box is and how it is as much of a curse as it is a blessing. It's was time for Vist to give it up, and let the final battle begin. Banager, angry, lashes out extoling the horrers of war, and if all he wants to do is help Mineva stop war. Cardeas content, and also dying from a gunshot wound, grabs Banager's hand, and links the Unicorn Mobile Suit to his biometrics. Banager sits down in the seat and the cockpit starts whirring to life. As he back out, slowly bleeding to death Cardeas wishes he had more time, more time to spend with his only son. He was happy they were able to meet even for such a short period of time, and glad that Banager was in possesion of the Unicorn as it was built for him, it was his destiny to wield it, The Key. (Yes I'm sure that's a slight EVA Nod). Banagher takes off to go defend the Colony from the remaining Zeon suit. The Unicorn is infinately powerful and is able to push the enemy buy sheer force. It crushes the enemy's hand. Once in open space the Zeon Suit activates it's funnles, this triggers the Unicorn to transform. It glows with energy, armor is moved around and the the Unicorn horn splits.... It's a Gundam. Cut to Black. This probably was the my favorite Gundam anything I've watching in a long time. Destiny and 00 were good, but something always seemed to be lacking. 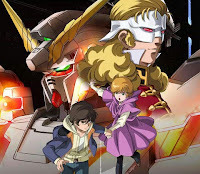 This was great combination of modern animation and story telling in addition to excellent use of Gundam Cannon. There are still stories to tell in The Universal Century. Its fine to watch without any knowledge of Gundam Mythos, it does a good job of explaining what needs to be explained. Being a fan there is a lot of little details that can be picked up on. I look forward to part II coming this fall.